← Cash for the Stash Purse! This year I’ve a few summer hats, mainly for a friend who has been having chemo, they came out pretty well so I decided to try making myself a couple of winter hats. I used a pattern by Emma Garry for a reversible bucket hat. She’s based in Ilkley, just up the road. When I bought the pattern it was Emma herself who was serving me, she happened to mention that it works well in winter weight fabrics such as tweeds, I decided to try fleeces first. The pattern goes together really easily and it’s also easy to adapt to vary the shape slightly. Having made the hats in the summer I knew I wanted the brim slightly deeper, I added about 1.5cm to the depth. The fleece was from B&M fabrics in Leeds market, two half metre lengths cost me all of £4, my original plan was to make a navy one and a camel one but I decided instead to make it reversible by using both fleeces. Having stitched the hat together I top-stitched round and round the brim in a spiral until I reached the main hat, I find it gives a bit more structure to the brim. I was pretty pleased how it came out as a general-everyday-going-on-the-bus sort of hat however my OH didn’t look over enamoured with the look, ‘…but you don’t do hats!’ was his response! He did look a bit happier when I shaped the brim down on one side. I do have to admit that in these photos I do look a bit of a mad woman!! Undeterred I decided to try another hat. Again the fabric was from B&M, but this time it was a gorgeous black fur, it feels fabulous and soft, but boy, the fluff gets everywhere!! I’ve not sewn with fur before and I have to admit I won’t be rushing out to make a coat anytime soon, even though I just love the fabric. I used a walking foot and lots and lots of pins, but it still wasn’t easy to work with. The pattern calls for edge-stitching round the crown, I did it but it was impossible to get the neat look I was after. I went round the stitching afterwards to ease out the fur which was flattened by the stitches. When it came to the brim, I still wanted to at least top-stitch once round but I decided to hand-stitch round instead which worked pretty well. I varied the pattern a bit for this one, I made the crown deeper as I wanted it to keep my ears warm and I made the brim a bit deeper still. 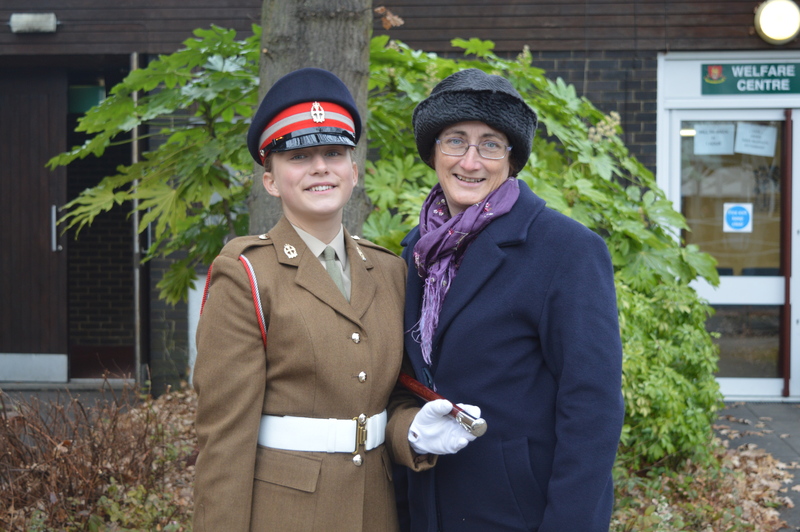 I love this one, I wore it last week to my daughters Army Passing Out parade, after 2 hours on a cold parade ground my feet might have been frozen but my ears were toastie warm! This entry was posted in Dressmaking, Serendipity and tagged Hat Making, Sewing fur. Bookmark the permalink. well I think you really suit a hat! Well done – you’ll be able to try something for Ascot this summer lol. You look great! Congratulations to your daughter.